awsum movie!! Fully sick! original, creative, different, FANTASTIC! I fell in love with movie I have since purchase dthe book however not quite the same. I have also purchased the movie and watchit at least once a day. I find it to be a great love story and the detail in the characters and the setting are unparalleled. One if not my favorite movie of all time. Even if it didn`t match up with the book, the movie itself was wonderful! The story line and the characters were heartwarming and funny! i can`t wait to watch it again! i think it`s an awesome movie and i am going to get it even thought i`m 13years of age itn wonderful movie and i really like the character aspashallythe girl. This movie was my first experience with anime. I think it was GREAT! I think this is the BEST movie ever!!! I love it and now I own it! I think it was Miyazaki`s best movie ever created!! The best movie ever! This is surely one of Hayao`s greatest films. the story is very interesting and i personally think Howl is one heck of a wizard! i love this movie.personally i love all of his movies. It was an awasome ride,The action dosen`t let up. Ive never read the book but I would love to if it is as good as this movie,so I say BRAVO! Another beautiful masterpeice from Studio Ghibli. A must watch!!!! I think It was really good book and movie story and pictures like magicl It was cool. THE BEST! I LOVE LOVE LOVE Anime and Hayaoh Miyazaki is my favorite Directer. I hope it wins at the Academy Awards!!! So beautiful, as all of Miyazaki`s work. It really captivated me, the music, the characters, the story everything is so amazing. This is the best movie ever!!! It`s so romantic!!! It is an amazing movie with the most wonderful story and amimation, clearly, miyazaki`s best work ever. Enchanting animation. A classic in an unique class of its own. This is the first movie of this type that I`ve seen. Although not near a masterpiece, it was nonetheless entertaining for someone not really into this genre. I got two words! SO and BORING!!!!!!!!!!!!!!!!!!!!!!!!!!!!!!!!!!!!! calcifer is just the cutest thing! Best miyazaki film by far. Captivating story...totally sucked me right in. So emotional and fantastic. Will watch again...and again. Joe Hisaishi`s music absolutely MELTS THE SOUL. Must thank these masterful duos - animated oscar for SURE. 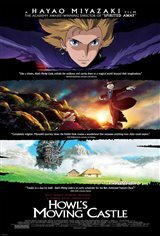 Howl`s castle is yet another masterpiece by Miyazaki. The animation is jaw-droppingly beautiful! I was thoroughly delighted and will go back to see it on big-screen again! The style is a cross between Spirited Away and Kiki. My two favourites. I loved it so much! It`s the best animated movie, make that the best movie I`ve seen in awhile! I LOVED IT! I WOULD WATCH IT OVER AND OVER AND OVER! One of the best movies I have ever seen, anime or not! It completely sucked me in with it`s incredible plot, and all the characters were deep and exceptionally likeable. Complete with humour, magic and a sweet love story, i recommend this movie to anyone! Miyazaki`s Howl`s Moving Castle was AMAZING! one of the best, its a must buy when it comes out on DVD. Its a movie a personally think everyone will love, the characters were great, the music was splendid, and it`s a must watch movie! I think this is one of Miyazaki`s greats. As Ebert stated, it had a little less story, and alot more spectacle. I loved it. i loved it; great story line and wonderful music. i`ll definitely buy the dvd when it comes out. Amazing and enchanting anime. The storyline is a little confusing due to the time constraint, but it is a great movie overall!